Do you need to use Eurocodes and reduce project time? Advance Design® is specifically dedicated to structural engineers who require a professional and easy-to-use solution for simulating and optimizing all their projects. Advance Design® includes a user-friendly structural modeler, automatic load and combination generators, a powerful FEM analysis engine (static, dynamic, time history, non linear, buckling, large displacement analysis, etc. ), comprehensive wizards for designing concrete and steel members, and efficient result post-processing and automatic report generators. It automatically updates all reports, including graphical results when modifications are made to the model. 1 – Powerful modeling system dedicated to engineers: realistic rendering, floors managements for buildings, complete library of user-definable structural elements, load generator, etc. 2 – Advanced analysis features: automatic mesher, time history analysis, static, dynamic, non linear analysis, etc. 3 – Latest versions of Eurocodes implemented: automatic design of concrete and steel elements according to EC1, EC2, EC3, EC8, with 3D interaction curves, deflections checking, buckling and lateral buckling checking, connections design, etc. 4 – “Result Memory” technology: avoid repetitive tasks by updating automatically all the post-processing documents (views and reports) when changing the 3D model. 5 – BIM and Collaborative work: DXF / DWG / Revit imports, multi-user technology, BIM approach for data synchronization, interoperability with industry standards (SDNF, CIS/2, IFC), etc. Internationalization is a major theme of version 2012 of Advance Design® with the implementation of several new National Appendices to the Eurocodes 0, 1, 2, 3, 5 and 8. This version also allows users to go further in the application of the Eurocodes with its many additional features: management of buildings open to the wind, design of timber structures to EC5 or calculation of cracks as a function of applied reinforcement to EC2. 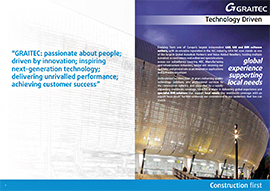 Advance Design® is the indispensable tool for the design of large scale projects.